Note: The Ex Christian Scientist does not advocate any one particular path but acknowledge that there are many legitimate pathways that can be personally and spiritually fulfilling. 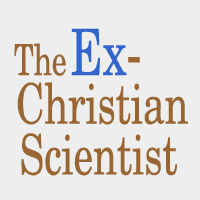 The views and opinions expressed by our individual contributors do not necessarily reflect those of the The Ex-Christian Scientist. I’m happy to share! Maybe my experience, strength and hope will help someone else. I’m not exactly sure how my mother got involved with CS, I think she met a woman at her job when I was about 4 and started talking with her, and somehow she became convinced that it was true. I do recall her saying she was looking for a church that I could go to as a child but that made no sense, because there were plenty of others she could have chosen. So really it was something that I was forced to participate in from age 4 until I turned 18 and got out of there. I can’t say that I really believed it but it was just like any other unhealthy situation we grow up with, until we can do better. I was deprived of medical care, glasses, and anything else that was needed because going to the doctor or taking medicine was Animal Magnetism and Materia Medica. She had glasses though and said that’s because she hadn’t made her demonstration and wanted me to make mine. I got glasses when I was in Middle School because the school called her since I had to sit right at the blackboard to see. I had bad acne that went untreated and female problems that went ignored. But I digress…When I was 12 I used to go to the Baptist church for youth services and knew something was different. My mother didn’t like for me to go and discouraged me so I stopped. But I always remembered how different it was. In High School I was in the choir and was around a lot of kids who also went to the Baptist church and I wanted to be like them. I started reading the Bible by itself on my own. So as soon as I got out of High School, went through I revolutionary period where I hung out with people from different religions and threw away every book and piece of literature I had from CS. I was angry and hated her and them. I think that parents who deprive their kids of medical treatment should be charged with neglect and abuse. Finally at 23, I accepted Christ the Bible way, was baptized, and moved on with my life. I go to the doctor when I need to although I try to live healthy without the FDA. I believe that The Bible is true and there is no key to understanding outside of the Holy Spirit. Doctors are gifted men and women who help us when we are sick. I believe God heals, but it’s through His Word and not some method that a delusional woman made up. My mother resents me to this day for leaving CS but I don’t care. There’s a lot more I could say but it’s all in the past now. We live in the USA and can practice any religion we want, or none. Good job, following your own path and finding out that doctors are not evil. Good job sticking with your own instincts regarding christian science and medical care. I am sorry your mom doesn’t support your choices. It hurts like hell when your mom doesn’t support you. Thank you for sharing your story!! I am sorry you suffered through CS. But you found a way out. And it sounds like you found a faith that helps you a lot. I understand as I am in the same boat. Thanks for sharing! How does someone post a personal story on this site? I would very much like to tell my ” story ” to people who I know will understand. Thank you!